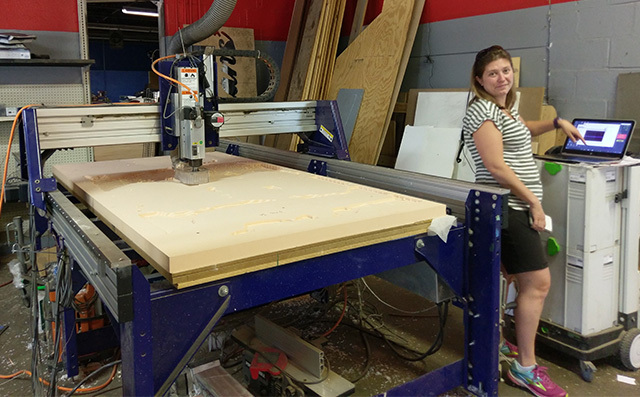 July 23, 2018 -- Be sure to read all about this project on the Vectris CNC hardware Case Studies page where the project is featured, ahead of a presentation by the Neathawk Designs team at the Vectris annual User Group Meeting in October. 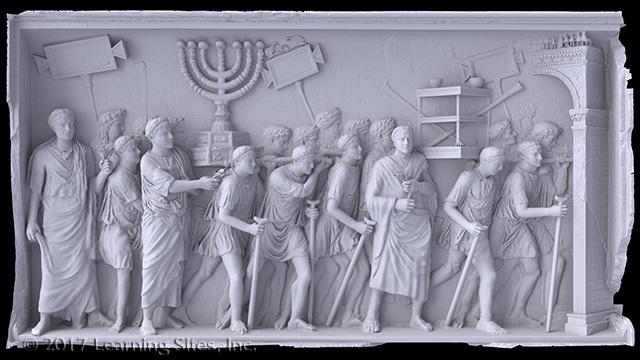 The goals of the Arch of Titus Spoils Panel project are to (1) digitally colorize a 3D scan of the existing panel based on pigment found in situ (hover over the photo of the existing relief at the left to enlarge; photo © and courtesy Steven Fine); (2) produce a full-sized carved replica of the relief for installation in the Yeshiva University Museum as part of their exhibition on the arch; and (3) digitally reconstruct and colorize the missing bits of the panel, including all the lost arms, legs, and bits of clothing. 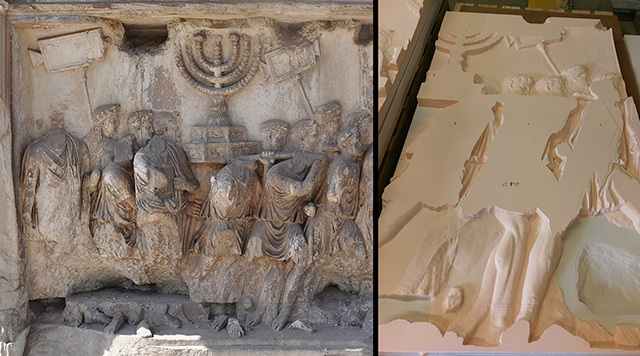 This project proceeds under the guidance and watchful eyes of Steven Fine (Churgin Professor of Jewish History, Director, Center for Israel Studies, Yeshiva University; Director, The Arch of Titus Project); Peter Schertz (Jack and Mary Ann Frable Curator of Ancient Art, Virginia Museum of Fine Arts); and the staff of the Yeshiva University Museum (under the direction of Jacob Wisse). 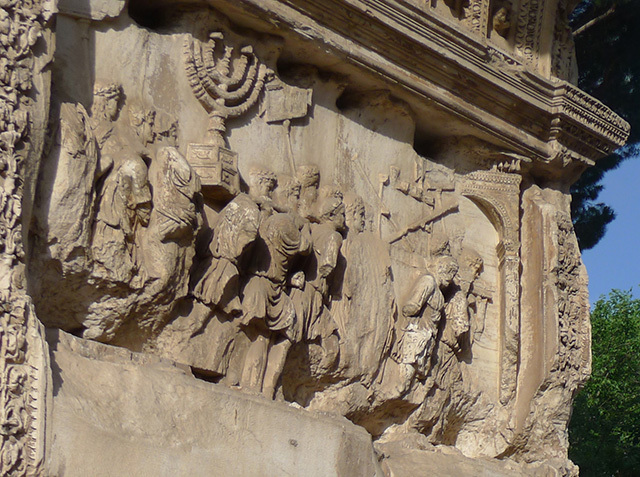 The Arch of Titus is located at western end of the Via Sacra (the Sacred Way and main processional street) in the Forum in Rome (hover over the image that shows the arch at the left to enlarge; image © and courtesy Steven Fine). The arch was built around 81 CE during the reign of Emperor Domitian to celebrate the triumph of his brother, then general, Titus (he ruled as Emperor Titus from 79-81 CE) in the Jewish War of 66–74 CE (chronicled by ancient Jewish-Roman historian Flavius Josephus in his writings called The Jewish War). The Roman victory in the Jewish War partly enabled the Flavian dynasty (first Vespasian, and then his sons, Titus and Domitian) to gain power and fund the construction of the Colosseum, among other works in a around the forum. 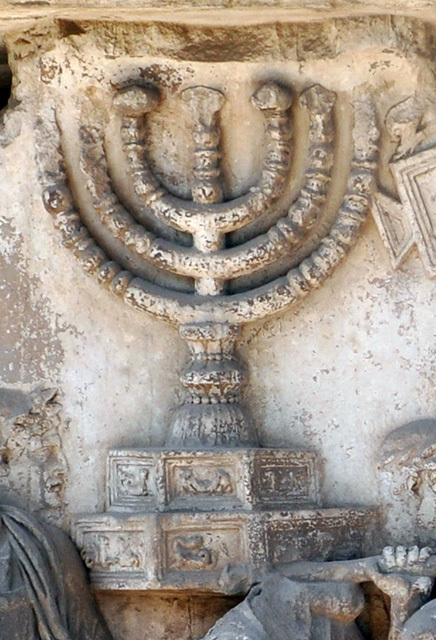 The marker below points to the location of the Arch of Titus. Among the reliefs adorning the arch are two large (c.2.1m x 3.9m) deeply carved panels flanking the walkway beneath the interior vault. The relief on the north side depicts the victorious Titus riding a quadriga (four-horse chariot). 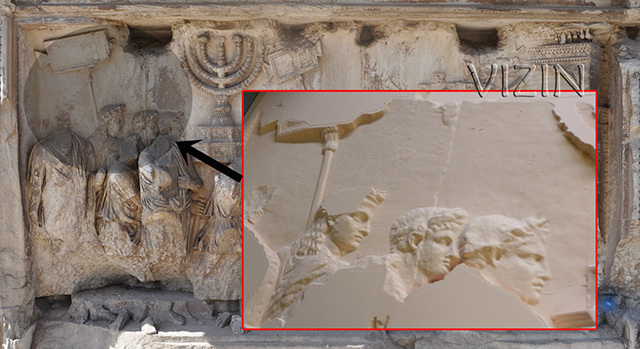 The relief opposite (its location indicated by the red arrow; hover over the image at the left to enlarge; image © and courtesy Steven Fine) shows a procession of Roman soldiers carrying the spoils from the destruction of Jerusalem into the city of Rome through the arch. 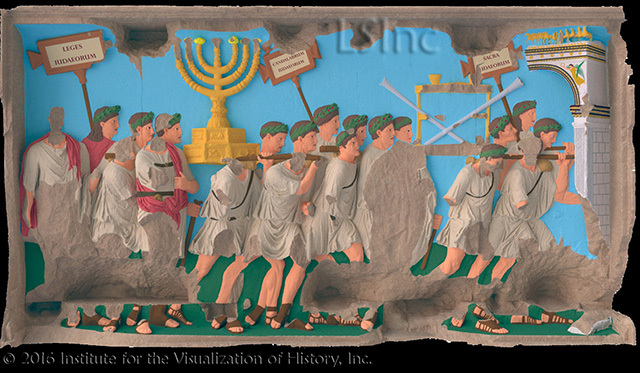 The Spoils Panel depicts a line of Roman soldiers, some carrying placcards (that once held explanatory text), parading key objects taken from (one presumes) the Temple in Jerusalem after their victory over the Jews. Among the objects the relief displays are the Temple menorah, the table of the showbread, trumpets, and sacred cups. 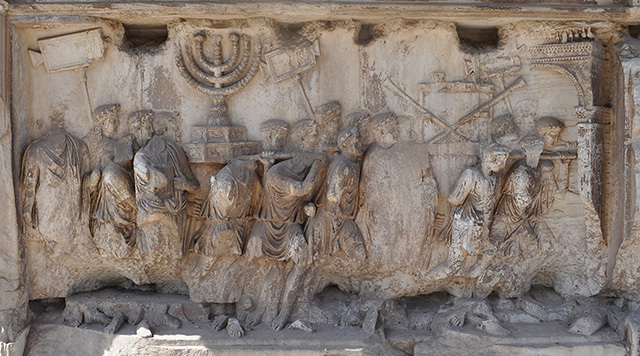 The procession moves toward the right where a segment of the Arch of Titus is carved showing what the event might have looked like in the summer of 71 BCE. The spectacle was chronicled in detail by the contemporary Jewish-Roman historian Flavius Josephus in his Jewish War. 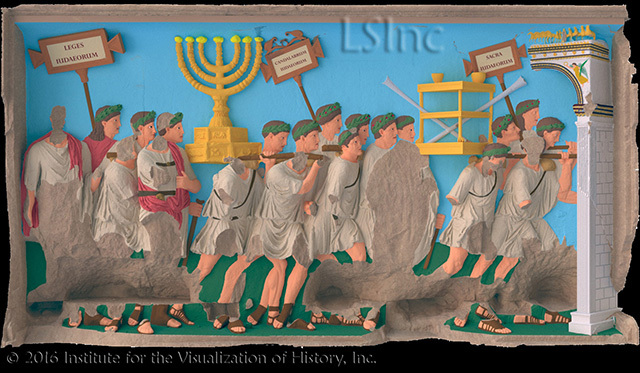 In 2012, a team of historians, scientists, and archaeologists began to study the spoils panel in the hopes of discovering (and then reconstructing) the original colors of the Roman relief. Using Ultraviolet visual absorption spectrometry, a technique that uses white light and a spectrometer to measure the wavelengths of the reflected light from a surface, Heinrich Piening (Department for the Conservation of Castles, Gardens, and Lakes, State of Bavaria, Munich, Germany) investigated likely crevices of the relief. The measurements taken from the menorah corresponded to yellow ochre, confirming for the first time that the color of the menorah on the relief was meant to evoke the gold of the original taken from Jerusalem. 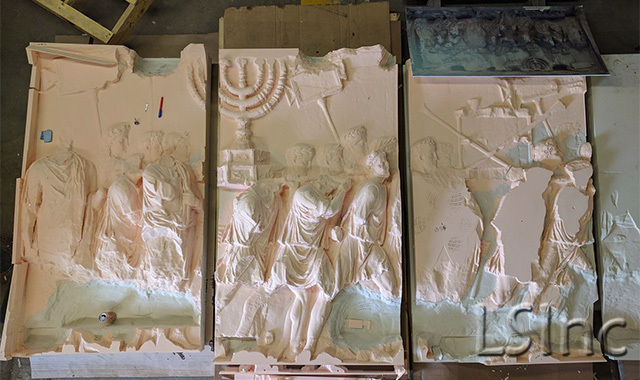 Based on this exciting discovery, the team wondered whether, based on other Roman sculpture colorization efforts (e.g., Pollini 2015; Ny Carlsberg Glyptotek 2012; Brinkmann 2010; Rossini 2010), it would be possible to recolor the entire spoils panel. Learning Sites' sister organization, the Institute for the Visualization of History was hired to make this happen. Using ancient literary sources, evidence from Roman wall paintings, traces of color detected on other Roman sculptures, archaeological evidence, and scholarly intuition, colors could be defined for most of the features of the panel (Fine et al. 2017:33-35). Based on pigments identified on other Roman sculptures and architecture, the Institute sent those chemical characteristics and their corresponding Kremer standard pigment numbers to officials at the Kremer pigment company, Aichstetten, Germany. They, in turn, were able to re-create the pigments and provide the Institute with exact computer equivalent RGB values. 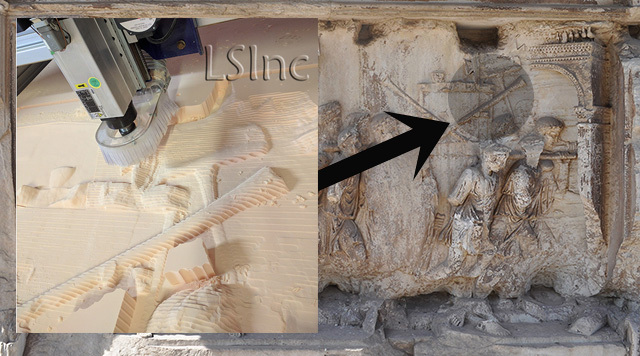 This process ensured that the colorization of the spoils panel would accurately reflect the archaecological evidence (see the preliminary colorization of the existing relief at the left; hover over to enlarge; and then watch the video). 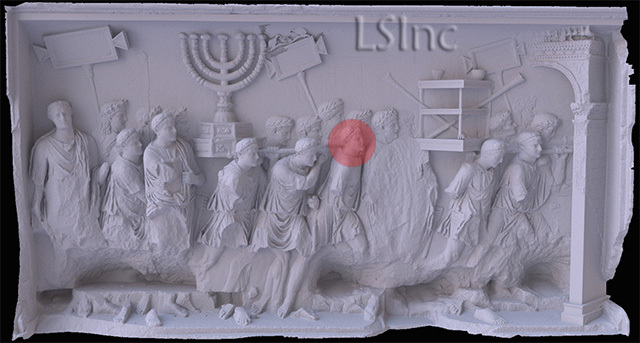 We were provided with a detailed 3D scan of the spoils panel (shot by UNOCAD of Italy; http://www.unocad.it/cms/) which was imported into our modeling software allowing us access to all the surfaces of the carving. Once the colors were in place, we began to reconstruct some of the missing features of the relief (see the reconstructed and colorized render at the left; hover over to enlarge). Compared to the version above, the following items were remodeled: the background holes in the relief were patched; the menorah tips were completed; the dolphins atop the central placcard were restored; the showbread table was reconstructed; the arch pilaster and other architectural details were reconstructed, as well as other features throughout the relief. We took cues from nuances in broken bits of stone seen in the 3D model of the relief (but not readily visible in photographs) in order to accurately rebuild objects like the showbread table (which had been incorrectly redrawn in previously published reconstructions; e.g., Yarden 1991; Pfanner 1983; Holzinger 1901). The next step was to attempt a digital restoration of the missing heads of the soldiers. We picked the most complete head (circled in the uncolorized render from our 3D model at the left; hover over to enlarge). We cloned that head in our modeling software and imported it into a special modeling package to "finish" the head. It was then copied onto the bodies with missing heads and stretched and adjusted to fit exactly onto the remnants of necks still visible, matching the angle of gaze and tilt using clues from bits of head still remaining on the relief. The result was the image rendered at the left (hover over to enlarge), in its current state, with slightly altered background colors and other minor tweaks. Subsequently, with the aid of Steven Fine and Peter Schertz, we will be digitally reconstructing all of the rest of the missing and broken parts of the relief, including the hands, arms, feet, and clothing. 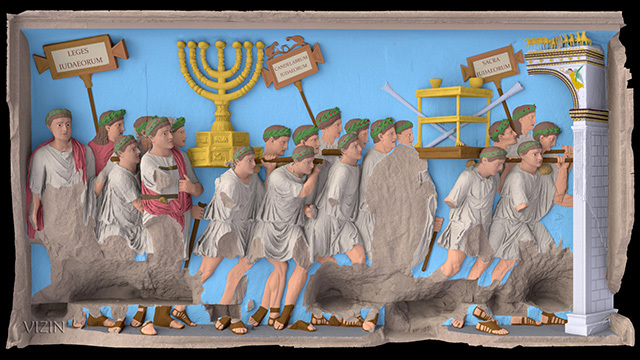 September 14, 2017 update -- The final digital reconstruction and colorization (see the images at the left; hover over to enlarge) has been installed at the Yeshiva University Museum for their exhibition on the Arch of Titus. In the exhibition, our images are projected over the carved replica described below for a dramatic view of the original appearance of the relief, not seen in 2000 years. 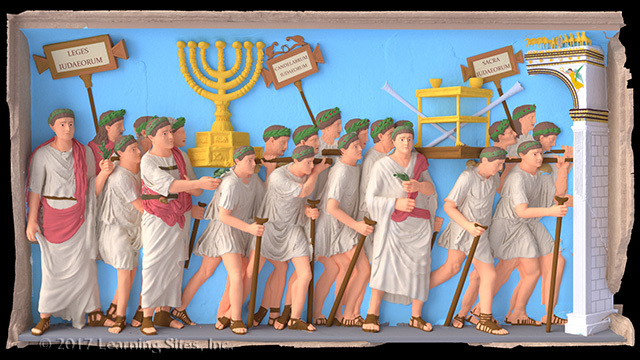 Our digital restoration of the relief panel shows how much is missing and helps to bring to life the movement and action of the procession. The reconstruction was painstakingly completed based on bits of evidence remaining in the broken rock of the original, 17th-century etchings attempting the same reconstruction, consultation with experts, and comparison with other carvings of the period. 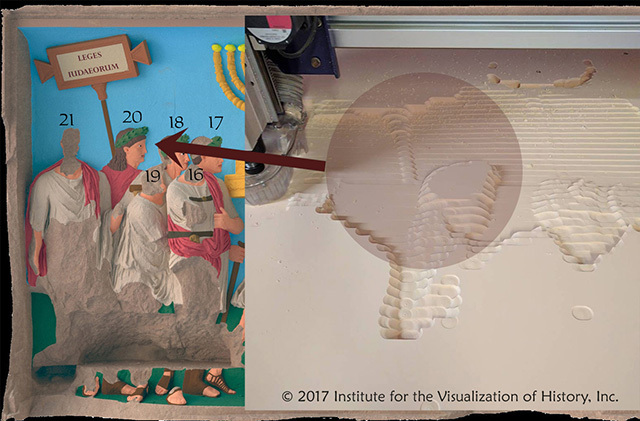 Under the direction of Neathawk Designs (Williamstown MA), using their CNC (Computer Numerical Control) machine (seen at the left; hover over to enlarge) to mill a full-scale replica of the Spoils Panel, worked with the Institute to provide the Yeshiva University Museum with an innovative and unique display for their exhibition on the Arch of Titus (opened September 2017). 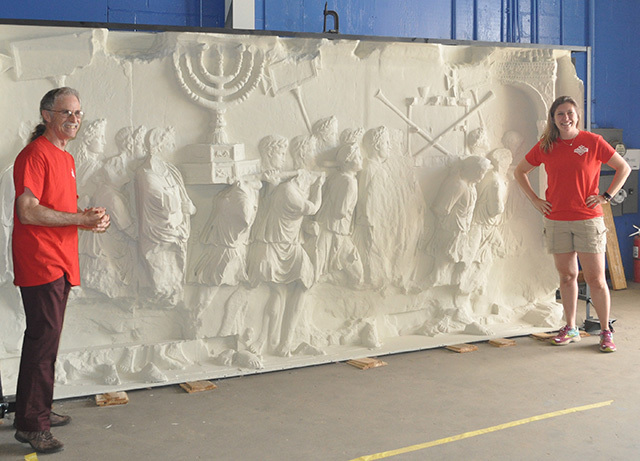 The exact replica will be carved out of high-density urethane foam and then painted to match the look and feel of the currently preserved relief in Rome. Once the panel is installed in the museum gallery, we will project onto the surface a fully restored and colorized image of what the relief may originally have looked like, providing visitors to the museum with a heretofore unimagined glipse into the past. Neathawk Designs work on the replica has been covered by ShopBot, the manufacturers of their CNC machine. A preview showing the early stage carving of one of the soldier's heads and part of the placcard staff behind him (hover over the image to enlarge). Watch these pages and Neathawk Designs for continuing progress images. Another image showing progress carving the heads. 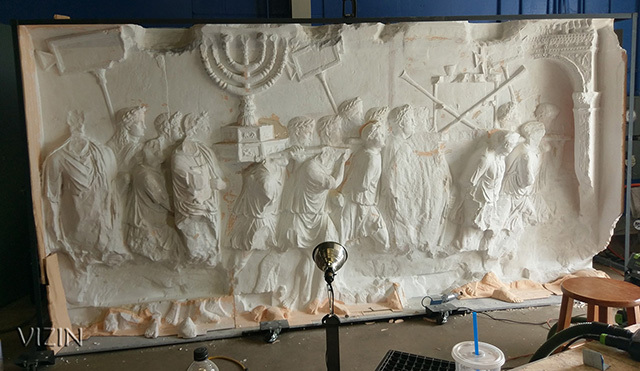 Another image showing progress carving the menorah guys. Another image showing progress carving the soldiers carrying the table of the showbread (with crossed trumpets and a cup on top). 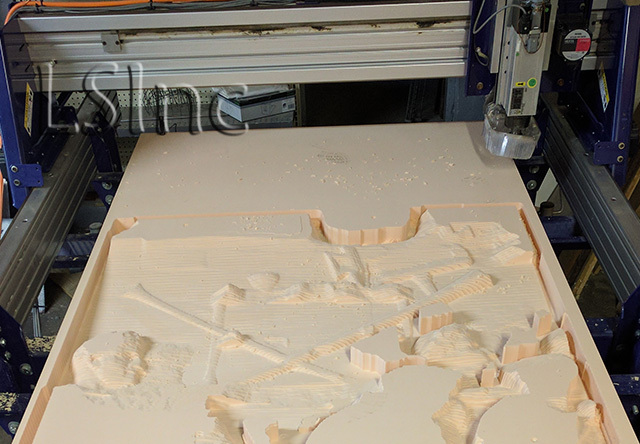 Another image showing a detail of where the current carving is happening. Progress shot showing the assembly of the panel sections beginning to come together, and the whole image coming into view. Vertical section 3 completed (note the photo of the original relief as a guide to the piece recently carved). The current status (with a little over two weeks remaining before transport and installation in the museum) showing the first two vertical panels completed, and work continuing on section 3, the soldiers holding the table of the showbread. The full replica epoxied into place with the first coat of primer being applied. Final hand sanding and small detailing is continuing. 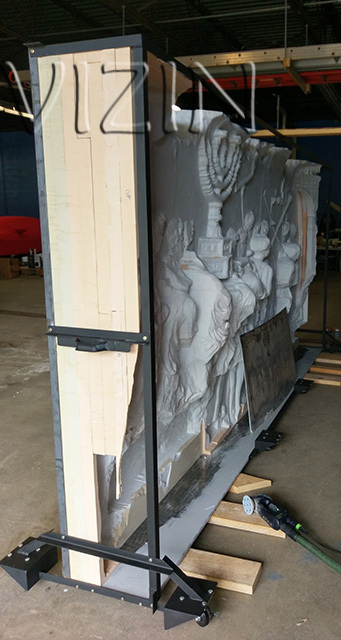 The fully carved panel set upright for the first time and housed in its traveling frame. Nearing completion of the spoils panel. This image shows a stage during which the final details are hand-cleaned and the entire panel is being primed for final painting. See our Press Release page for information about the unveiling of the panel before it's shipped off to NYC for exhibition. The replica installed in the Yeshiva University Museum (NYC) in preparation for the public opening of the exhibition on September 14, 2017. The photograph at the left shows the replica panel and Lindsay Neathawk (lead technician at Neathawk Designs) being interviewed for a video showing the carving, assembly, and moving of the panel. 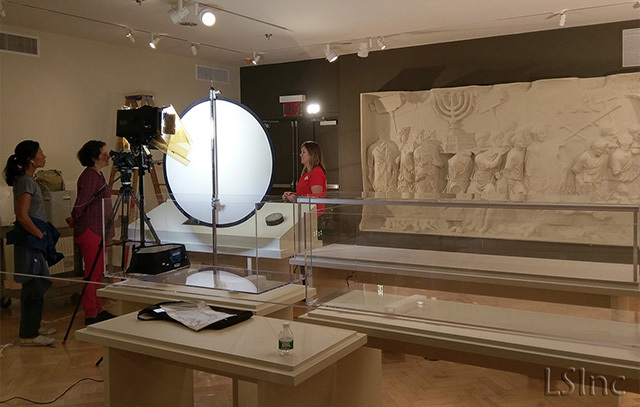 A video showing the "making of" the replica panel and its journey to the Yeshiva University Museum has been compiled by the university and can be viewed on their YouTube channel or FaceBook page. 2010 Circumlitio: the polychromy of Antique and Mediaeval sculpture. Chicago: University of Chicago Press. 2012 Tracking Color: the polychromy of Greek and Roman sculpture in the Ny Carlsberg Glyptotek. Preliminary Report 4. Copenhagen: Ny Carlsberg Glyptotek and the Compenhagen Polychromy Network. 1983 Der Titusbogen. (Beiträge zur Erschliessung hellenistischer und kaiserzeitlicher Skulptur und Architektur, 2). Mainz am Rhein: Philipp von Zabern. 2010 "From Scientific Findings to Reconstruction: The Technical Background to the Scientific Reconstruction of Colours," pp.108-14 in Brinkmann, et al., eds. Circumlitio: the Polychromy of Antique and Mediaeval Sculpture. Frankfurt am Main: Liebieghaus Skulpturensammlung. 2015 "Some Observations on the Use of Color on Ancient Sculpture, Contemporary Scientific Exploration, and Exhibition Displays,” pp.901-910 in P. Pensabene & E. Gasparini, eds. Interdisciplinary Studies on Ancient Stone: Asmosia X. Proceedings of the Tenth International Conference of ASMOSIA-Association for the Study of Marble & Other Stones in Antiquity, Rome 21-26 May, 2012. Rome: Bretschneider. 2010 "Colori dell'Ara Pacis: storia di un esperimento," Archeomatica 1.3:20-25. 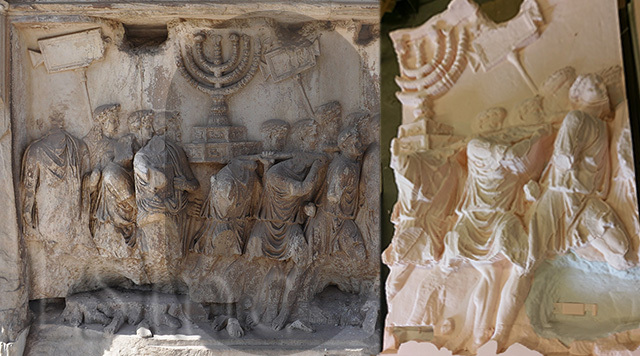 1991 The Spoils of Jerusalem on the Arch of Titus: a re-investigation. Skrifter utgivna av Svenska institutet i Rom. 8. Uppsala: Astrom.